Two remarkable Panathletes from West Yorkshire have been added to our 2017 roll of honour as we celebrate this year’s highest achievers across the country. Charlotte Hirst and Billie Lambert, who both attend Brighouse High School, have to contend with severe disabilities. But both girls have shown the strength of character, passion and determination to accomplish great things in the sporting arena, thanks in no small measure to Panathlon. On Friday, Charlotte was presented with her ‘Outstanding Achievement’ runner-up trophy, and Billie received her ‘Highly Commended’ award in a special end-of-year school assembly. They were joined by our ‘Outstanding Achievement’ winner for the county this year, Thomas Green. Both girls’ stories are uplifting and inspiring in equal measure. Charlotte has cerebral palsy and spastic diplegia and uses either a wheelchair or walking aid to get around. She walked for the first time only seven years ago after surgery on her hips and knees, followed by intensive physiotherapy. She still has physio now, but wearing splints on her legs has given her more mobility and confidence. Charlotte first tried Panathlon in 2015 and immediately loved playing Polybat, boccia and New Age Kurling. She soon started attending extra-curricular clubs at lunchtime and representing Calderdale at the West Yorkshire School Games. She attended the Disability Leadership Academy day where she gained the skills to lead others in boccia and New Age Kurling, enabling her to help out at the extra-curricular sports club on Friday lunchtimes with younger students. She also has swimming lessons to help build her muscle strength and is looking into starting wheelchair rugby. 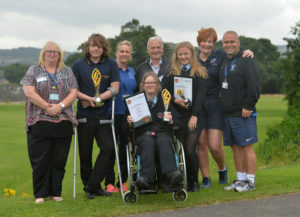 The confidence she has gained and commitment she has shown to improving is a credit to ‘Charlie’ (as she is nicknamed) and the PE department at Brighouse High – and it’s a journey she has made through Panathlon. Charlotte commented: “It feels awesome to get the second highest award in West Yorkshire! “I didn’t really get into sports until Year 7 until I started doing boccia, Kurling and Polybat. Since then I’ve been to boccia tournaments and loads of Panathlons. Now I’m a qualified referee too so I can teach others how to compete and the techniques and tactics. It’s pretty cool. “Before Year 7 I never paid attention to sport as there wasn’t much I could really do. Now I can do loads of disabled sports and I enjoy it so much. Charlotte’s fellow Brighouse High student Billie Lambert received our 2017 Panathlon ‘Highly Commended’ trophy for West Yorkshire. She initially struggled to cope with her visual impairment after transitioning from primary to secondary school, until – through Panathlon – she discovered a talent for running. Her ability became more apparent when she joined her local running club, Halifax Harriers. She held her own competing against fully sighted pupils and her coach was not initially aware of her impairment. After a year of regularly getting annoyed with herself for drifting out of her running lane, she admited to her coach Brian Burgin (pictured left) that she was visually impaired. He admits he was stunned at the standard she had reached competing against her peers despite her disability. Billie has now been given a formal classification (T13) which means she will compete against others with a similar field of vision. Her main events are 100 metres and 200 metres and she is already training within the standard required to qualify for the GB team. Billie also dances in Freestyle, Contemporary, Rock and Roll and Street competitions, where she has been National U13 Street Champion for last two years. Billie has also been competing at National Level with her pairs partner in the Rock and Roll category where they finished first overall. Billie commented: “I never had enough confidence to do sport on my own unless someone else came with me. I was a bit shy. But at Panathlon I saw children whose lives are much harder than mine. Witnessing these children being so happy when they’ve got such a different life to everyone else made me realise other kids have it a lot harder than me. If I’m lucky enough in the future I’d like to help kids like them find confidence as I have done. Burgin, who is credited with launching the career of 10-time World Para Athletics gold medallist Hannah Cockroft, says the sky is the limit for Billie. Despite going to different schools, Billie and our West Yorkshire award winner Thomas have become firm friends since they joined forces in the Calderdale team that won the Panathlon Yorkshire Multisport Final in York in March.